Nine months can feel like an eternity to a pregnant woman, but 266 days is short compared to the longer gestation periods that many animals go through. For most species, the gestation period typically runs from conception until birth. The length of the gestation period for many animals is determined by the size of their species. Smaller species of animals generally have a shorter gestation period than bigger animals. In some instances, longer gestation periods can be found among more developed species. Elephants are social animals with a high degree of intelligence similar to dolphins and great apes. These gentle giants have the longest gestation period of all mammals, carrying their developing babies for nearly two years before giving birth. 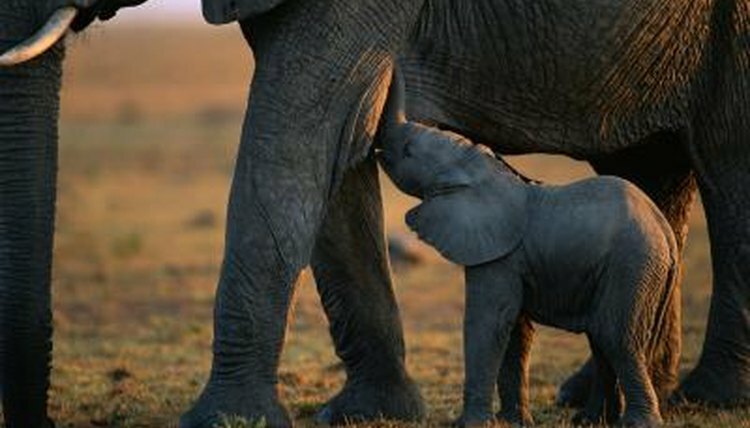 Because elephants are the largest land animal in the world with the biggest brains, their long gestation period allows for proper development of the fetus in the womb. After the gestation period, a single elephant calf is born that weights about 265 pounds. While female elephants can live up to 70 years, they generally only give birth to four babies during their lifetime. The white rhino is one of the largest of all rhino species, so it's not surprising that her large stature would lead to a long gestation period of 15 to 16 months. After the gestation period, the mother gives birth to a single calf weighing around 143 pounds. Female rhinos typically give birth to one calf at intervals of every two to three years. A calf will remain with her mother for around two to four years until the next offspring is born. All five species of rhinoceros are considered either critically endangered or vulnerable to being endangered, including the white rhino. Their long and slow gestation period is an obstacle to repopulating the species. Native to areas of the Middle East, northern India and arid Africa, the camel has evolved to survive in the desert and can go without water for up to three weeks. They are often referred to as “ships of the desert" because these sturdy creatures have served to transport humans and cargo across long distances throughout history. Camels are considered to be ill-tempered with stubborn personalities, even biting, spitting and kicking humans. Their long gestation periods of 13 to 14 months might contribute to their grumpiness. After the gestation period, they give birth to a single calf. With a gestation period of 15 to 16 months, the giraffe has one of the longest gestation periods in the animal kingdom. Known for being the tallest terrestrial animal in the world, the mother gives birth while standing up. The baby calf emerges with her front legs and head first and then falls to the ground, which serves to sever the umbilical cord. The newborn giraffe will already stand 6 feet tall and be able to walk and run within only one hour after birth. Calves remain dependent on their mother’s milk for nine to 12 months. Orcas, also known as killer whales, are typically found in the Antarctic and Arctic, and occasionally off the coast of Oregon, Washington and California. Known for their high intelligence, gestation is typically between13 to 16 months. After gestation, a single calf is born that weighs around 400 pounds and can measure up to 7 feet long. A calf will remain by his mother's side for up to two years. Orca whales have become one of the most contaminated marine animals in the world. Chemical and pollution contamination of the oceans has led orcas to be more susceptible to disease, which most likely causes reproductive difficulties, according to Defenders of Wildlife. How Long After Weaning Can a Cow Be Reunited With Its Calf?